The telephone started its life as a piece of utility equipment whose design was driven by function alone. 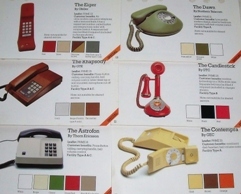 The release of the GPO700 series of plastic cased telephones in 1959 allowed for a range of colour choices so that customers could match a telephone to the decor of their room. As telephone ownership in the UK began to grow so too the Post Office began to realise that customers would appreciate more choice in the designs on offer. The Trimphone was an early example where the focus was clearly on creating an attractive and stylish design as an alternative to the standard 700 series. Of course customers had to pay extra to rent the Trimphone thereby also establishing it as a premium telephone and allowing customers to feel that they might be a little posh if they had one. Special anniversaries and events soon became the focus of attention for telephone manufacturers; none more so than the Queen's Silver Jubilee of 1977 when a commemorative version of the Compact telephone was relished resplendent with a royal crest in the centre of its dial. Later in the 1970s a complete range of new designers was released onto the market. Known as the Special Range these offered designs that included the Contempra, Dawn, Ericofon, Eiger and even one modelled on Mickey Mouse! The telephone had evolved from being a utility piece of equipment into a design object. Rather interestingly, today it appears to have reversed back into a utility object perhaps because the telephone and the mobile is so prevalent that we now want it to blend into the background and unlike in the 1970s and 1980s, we no longer feel a need to show off the fact that we have a telephone in our homes! The Compact telephone, as its name suggests provided a much smaller handset unit. Whilst the circuitry inside was based upon the standard 700 series telephone, the smaller size was achieved by having a separate bell unit that fitted underneath the main telephone. The Compact model was introduced in 1974 and this example was manufactured by the PO Factory Cwmcarn to commemorate the Silver Jubilee of her Majesty Queen Elizabeth II, 1952-1977. It is marked on the underside with the reference number 2/SA4271-1. Two versions were released; an English and Scottish version. These were distinguished by the royal crest in the centre of the dial. This example is the English version. A special telephone manufactured by Pocket (UK) Ltd Manchester in April 1996 to celebrate the 100th anniversary of Guernsey Telecom (1896-1996). In 1978 the Post Office introduced a new range of telephone handsets that were of a distinctive design and appearance. They therefore offered an alternative to the standard 700 series models and the Trimphone. However, like all telephones at that time, customers had to rent their handset and couldn’t buy them. The special range attracted a higher quarterly rental charge and required the customer to pay a one-off installation charge. The special range was initially identified by reference numbers starting at SR1000 with later models designed to work with the Plug and Socket connections carrying the numbers TSR8000 onwards. However, most were referred to by their name. For example, the SR1002 was marketed as the Contempra. Examples from the above range are shown below. The Contempra design was introduced in 1978. 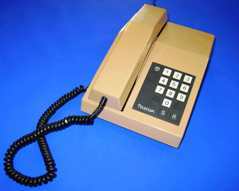 This example is model TSR8002/A and was manufactured by GEC-AEI Telecommunications, Newton Aycliffe, County Durham (GEN) in 1983. The Contempra was offered in three colours: gold, brown and orange; this being the brown version. In 1982 customers had to pay an installation charge of £20 for the Contempra and had to pay an additional £ 2.25 in quarterly rental. Also known as the ‘Pancake Phone’ this was the last design from British Telecom to contain a rotary dial. It formed part of Telephone Special Range and carried the number SR1008. It started production in 1981 and was manufactured by Northern Telecom for BT. The Dawn was offered in pale yellow, avocado green and white. In 1982 customers had to pay an installation charge of £20 for the Dawn and had to pay an additional £ 2.25 in quarterly rental. The upper photograph shows an example of the Dawn telephone in white. This particular telephone carries the markings S/250/GF/1981/AR on its base. The lower photograph shows an example in avocado green and this one carries the markings S/250/GF/1981/AR GEC D141610A on its base. The Eiger became available in 1981 and this version is the type A in stone coloured textured finish. It had a last number re-dial facility and an ‘S’ (silent) button which cut-off the microphone. The Eiger was supplied to BT by Gfeller Telecommunications of Switzerland and was offered in red, stone, two tone brown and dark grey. In 1982 customers had to pay an installation charge of £30 for the Eiger and had to pay an additional £ 2.25 in quarterly rental. This stone coloured version was produced in 1982. Manufactured from 1956 onwards by Ericsson, Sweden, the Ericofon or Cobra phone was a one piece telephone designed by Ralph Lysell and Hugo Blomberg. It had the unique feature of a dial hidden in the base of the phone. This Ericofon 600 model was released into the UK in 1978 by BT within their Special Range as TSR8007, available in either ivory (shown here) or orange. In 1982, the BT price list shows that customers had to pay a one-off charge of £20 for the Ericofon 600 followed by an additional £2.25 on their quarterly rental. Designed by Atea of Belgian these early push-button telephone were manufactured by GTE in 1982 and marketed within the Telephone Special Range (TSR) as the Rhapsody (SR1012, TSR 8012). The Rhapsody was offered in ivory, beige and tan leather (shown here). In 1982 customers had to pay an installation charge of £25 for the Rhapsody and had to pay an additional £ 2.25 in quarterly rental. Originally manufactured by the American Telecommunications Corporation (ATC) of El Monte, California, the Genie was released in the UK as part of the Telephone Special Range as number TSR8022 in 1983. 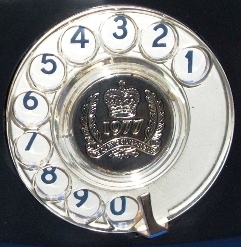 Although the keypad is arranged in the form of a dial, it is actually a push button telephone with last number re-dial and it had an electronic tone ringer, not a bell. It was offered in white, peach, red, brown and blue/white. The upper image is the blue/white version whilst the lower image is in peach. This peach version is also marked as having been manufactured for BT by A.P. Besson Ltd - Hove, Sussex (DAE) in 1983 (83/1).